Would you use gondolas that glided between Georgetown and Rosslyn? Officials in D.C. and Arlington, Virginia decided to take a closer look at the viability of creating a gondola system over the Potomac River. Either side invested $35,000 in public funds to conduct a study on the transportation option critics are calling a long shot. 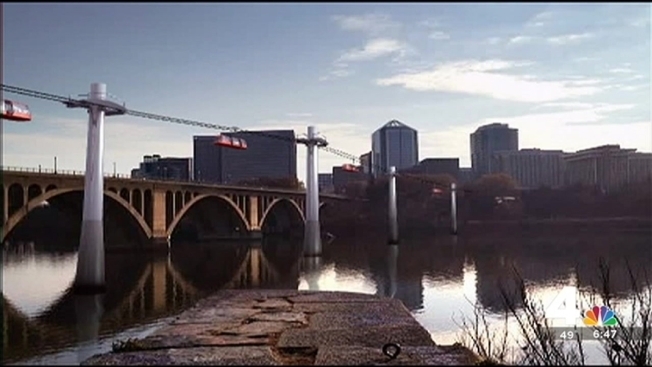 A ski lift-like system could transport 4,000 people per hour across the Potomac, and help connect people in Georgetown to the Rosslyn Metro station, Joe Sternlieb, the CEO of the Georgetown Business Improvement District said. "The great thing about this technology is there's no wait time," he said. "There's a car every 8 to 12 seconds to take you." Sternlieb said $70,000 in public funds was a low cost for determining if a gondola system is a good idea or not. D.C. resident Molly Weaver said she would use it. "It's beautiful, so to go over the river would be a really pretty view," she said. Arlington County Board Chair Libby Garvey is less sure. "I'm skeptical. I believe my whole board is skeptical. But we want to keep an open mind," she said. Why did she Arlington decide to fund the study, then? "I think probably in the long run, it will cost us less, even if we decide not to do it, to do the study, make the decision and be done," Garvey said. The study is expected to take a year to complete.